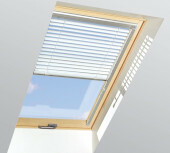 The AJP Venetian blind is a popular accessory for roof windows used to regulate the amount of light entering inside. By changing the angle of slats you can control the direction of sunlight and create a unique atmosphere. Side aluminium guide rails allow for better shading of the room and enable the sash to be rotated when the blind is pulled down. AJP in the wireless Z-Wave system is powered by 15V DC mains supply and operated by means of a remote control or wall switch. 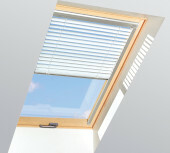 The electric drive in the AJP Z-Wave Venetian blind controls only the angle of slats. The operation in the standard version of the blind is possible only when the window is closed. The blind cooperates with FAKRO electric products equipped with the Z-Wave system such as the FTP-V Electro Z-Wave window or the AMZ Z-Wave awning blind. AJP Venetian blind AJP-E controlled by switch or remote control, powered by 24V DC, electric drive of AJP- E Venetian blind enables only changing the angle of the lamellaes nad operating AJP-E in standard version is possible only with the window closed.